The difference between the Brilliant Cut is that it is modern and the Old Mine Cut is antique. The explanation, however, is a lot more complicated than just age. The term ‘cut’ describes both the shape of a diamond and the symmetry, proportion, and polish of its facets. In this case, brilliant cut and old mine cut both refer to the symmetry and proportions cut into a diamond. The following is a brief overview of the history, style, and contrasts between the brilliant cut and old mine cut. The old mine style of cutting diamonds has been used since the end of the 17th century. Most of the old mine cut diamonds that exist today are found in antique jewelry from both Victorian and Edwardian eras. The old mine cut is the direct predecessor of brilliant cut diamonds, first created in 1919 by Marcel Tolkowsky. As we will discuss, the Old European cut was the bridge between the old-miner and modern brilliant. The progression in technology (and industrial revolution) was a direct cause in the rapid advancing of diamond cutting techniques. The old mine and brilliant cuts have many notable differences in every part of a diamond. 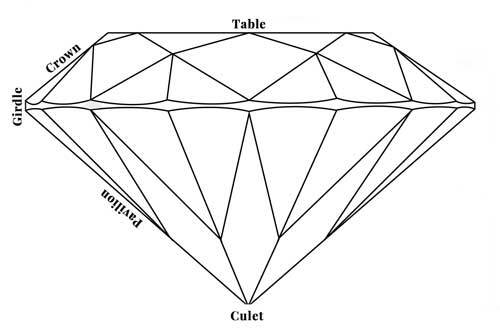 The relevant parts of a diamond include the table, culet, crown, girdle, and pavilion. The table is the top facet of a diamond. It is one of the best ways to differentiate between brilliant cuts and old mine cuts. In brilliant cut diamonds, the table is 53% – 64% percent of the girdle diameter. In old mine cuts the table is 38% – 45% of the diameter. The culet is the diamond’s bottom facet and is the quickest way to identify antique vs modern diamond cuts. When the old mine cut was created, technology wasn’t advanced enough to create an exact pointed tip at the bottom of the diamond. Instead, the culet was left as a wider platform, parallel to the table. In brilliant cut diamonds, the entire diamond is mapped in a specialized machine to determine its shape before cutting begins. The culet is shaped on a cutting wheel and looks invisible to the naked eye. The crown of the diamond is the angled portion between the table and the girdle. In old mine cut diamonds, the crown is traditionally angled at 40 degrees or greater. Modern diamonds have an ideal angle of 34 degrees. When examining the old mine cut diamond, it will appear to be a lot taller than the modern cut diamond. The girdle is the narrow space that dividing the crown and the pavilion. In antique diamonds, the girdle is usually much thicker than what is common nowadays. It was common for diamond cutters to leave a single, continuous, unpolished surface around the stone. The bruting machine, invented in the 1890s allowed jewelers to facet and polish diamonds. Even until the 1930s, though, most girdles were left bruted, unpolished and unfaceted. Today, diamonds are either faceted or bruted, but they’re always polished. Unfortunately, this method doesn’t always help to differentiate modern from antique diamonds. Many owners of antique jewelry have had the girdles on their diamonds updated and polished. The pavilion is the slanted area that runs from the girdle to the bottom of the diamond. 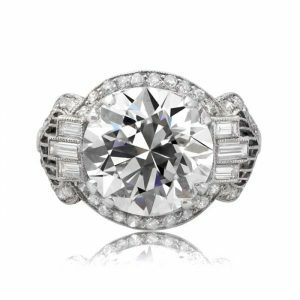 In brilliant cut stones, the ideal angle is 42 percent of the diamond height. This percentage creates a very short, squat stone and lot more internal brilliance. In old mine diamonds, the pavilion is much deeper. Diamond cutting has evolved from hand-operated tools to today’s convenient imaging and automated cutting tables. Still, diamond cutting relies on the talent and skill of the diamond cutter. It is still a very difficult and exacting craft. 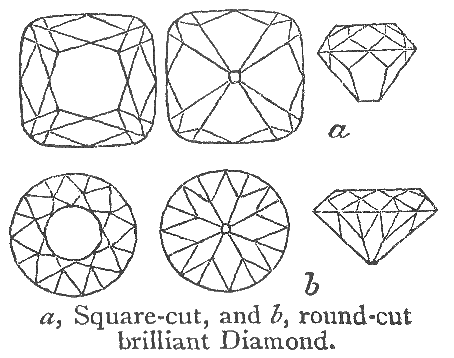 No two cuts were identical in antique diamonds. Today, however, there are established standards to maximize the brilliance of each stone. Even though both old-mine cut diamonds and brilliant cut diamonds have the same amount of facets, modern jewelers and cutters have better tools. They are able to create precise lines and angles to maximize the brilliance of each stone. Aside from the technical differences listed above, there are many subjective differences people consider when purchasing a diamond. Old-mine enthusiasts will usually describe the old mine cut diamond as fiery and warm. Some explain that because the modern diamond is designed for optimum brilliance, the old mine retains a livelier inner light. Another very important element is age and rarity. There are countless, modern, brilliant diamonds in circulation, but only a handful of old mine diamonds available. Unbeknownst to most consumers, there is technically no official diamond that is named as an “old mine cut”. The term “Old Mine” is used to describe all antique diamond cuts that were cut by hand. It applies especially to those cuts which fail to be described more specifically. Rose, cushion, old European, and more are all cuts that are often promoted collectively under the old mine umbrella. Also, a diamond must be antique – that is, more than 100 years old – to qualify as a genuine old mine cut. You will see vintage diamonds described as old mine, but this isn’t strictly correct. The reason age matters is that diamond cutting techniques improved considerably at the beginning of the 20th century. Cuts that came after were usually done with machines rather than by hand. The precision involved warranted far more individual descriptions and classifications. As an example, the modern round brilliant cut has its origins firmly in the old mine era, but would never be described as such. Click here to learn more about Old Mine Cut Diamonds. The old European cut is an old mine cut, but not old mine cuts are old European. As an example: All Ferrari’s are cars, but not every car is a Ferrari. The old European cut is the first diamond that uses a more precise method of cutting. It is a more defined shape than the typical old mine cut. The old European cut is a transition from the old to the new. It is based on earlier cuts but, in turn, a basis itself for the round brilliant cut we see today. Old European cuts were used during the art deco period. They are also suited to the earlier Art Nouveau Era due to the roundness, and relative softness of the cut. 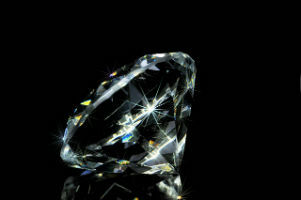 Click here to learn about Old European Cut Diamonds. 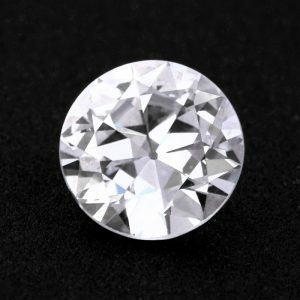 The biggest difference between antique and modern diamond cuts is that old stones are much shallower, with usually only about 50% of the height of the overall stone being taken up by the pavilion, compared to around 85% today. This gives old European and similar cuts much less brilliance than is typical now. Instead, they have an added depth and fire that is still very much sought after. Although we mention a true roundness being achieved when old European diamonds were cut, it’s fair to say that they probably wouldn’t pass a moderately close inspection if they were to be measured for actual roundness. However, they were a significant step forward at the time and, when side by side with a modern round brilliant would look pretty much the same to the untrained eye. A bigger issue with old European cut diamonds than whether they are perfectly round or not is the cutting of the facets. Because of the fact that hand-cutting was still the predominant method used, facets are often irregularly shaped and quite a way removed from the perfect symmetry we see in diamond cutting today. For all the “faults” of an old European cut diamond that we’ve mentioned, it is these differences which make each stone unique and which all add to the appeal of antique diamonds. Many antique diamonds, and old Europeans, in particular, have since been recut to bring them up to date and to tidy up their appearance. This adds further to the uniqueness of the stones and adds a certain charm which the mass-produced cuts of the day will never equal.